Have you ever thought of controlling any peripheral from anywhere in the world? Yes the IoT (Internet of things) has made this possible to control any appliance from anywhere and there are many IoT hardware and cloud platform are available to achieve this. We have covered many IoT applications in our previous tutorial. Today we will use Google Firebase cloud to control an LED using NodeMCU ESP8266. If you don’t know that what Firebase is, then I will try to tell in brief. Firebase is Google’s database platform which is used to create, manage and modify data generated from any android application, web services, sensors etc. For more information on Firebase please visit the official website of Google Firebase. To control an LED from Firebase, first we will set up the NodeMCU ESP8266 Wi-Fi Module and then set up Google Firebase. Setting up NodeMCU is very easy and it won’t take much time. This can be done in few simple components and simple steps. If you don’t have NodeMCU ESP8266(12E) then you can also use Generic ESP8266 module with Arduino UNO and Arduino IDE. To know how to program Generic ESP8266 module using Arduino UNO and Arduino IDE, just follow the link. Goto ‘Tools’ and Select ‘Boards’. In board’s section, select ‘NodeMCU V1.0 (ESP-12E Module)’. Also select appropriate COM Port. After finding the “FIREBASE_HOST” and “FIREBASE_AUTH” following the steps mentioned below, edit this in sketch given below and upload. If you are completely new to ESP8266 then start with Introduction of ESP8266 article. Complete program with working Video is given at the end. Here we are explaining few important parts of the code. Firstly include the libraries for using ESP8266 and firebase. While compiling, if you get error that ArduinoJson.h library is not installed then please install it using link given above. These two parameters are very important to communicate with firebase. Setting these parameters will enable the data exchange between and ESP8266 and firebase. To find these parameters for your project, follow the steps given in later section (Setting Up Firebase) below. After successfully finding the credentials, just replace in the above code. Below parameters are used to connect to your home Wi-Fi network or the network that you setup. Replace SSID and password with your network SSID and password. Also internet is required in order to communicate with firebase. This statement tries to connect with your entered Wi-Fi network. When connecting to Wi-Fi, if it doesn’t connect to network then just print(.) until it is not successfully connected. This is the class provided by firebase library to send string to firebase server. To use more classes go to this link. Initially send one string to the home path. With the help of this we can change the status of LED. After sending one status string to firebase path, write this statement to get the status of LED from same path and save it to variable. If received string is “ON” or “on” then just turn on built-in LED and externally connected LED. If received string is “OFF” or “off” then just turn off built-in LED and externally connected led. If received string is not any of these then just ignore and print some error meesage. If you are using Firebase first time then you may take some time to setting it up. Have patience and follow these steps. 1. If you have Gmail id then you don’t need to Sign Up for firebase, if you don’t have Gmail id then Sign Up for one and then you can go to next step. 5. Input your Project Name. 13. Copy the secret key and save it to notepad. This is your “FIREBASE_AUTH” string which we have written in Arduino program above. 21. You can explore the firebase but let’s finish the tutorial first. Now put “FIREBASE_HOST” and “FIREBASE_AUTH” in Arduino program and upload the sketch. And we are done with setting up both sections. Complete Arduino Program is given at the end. 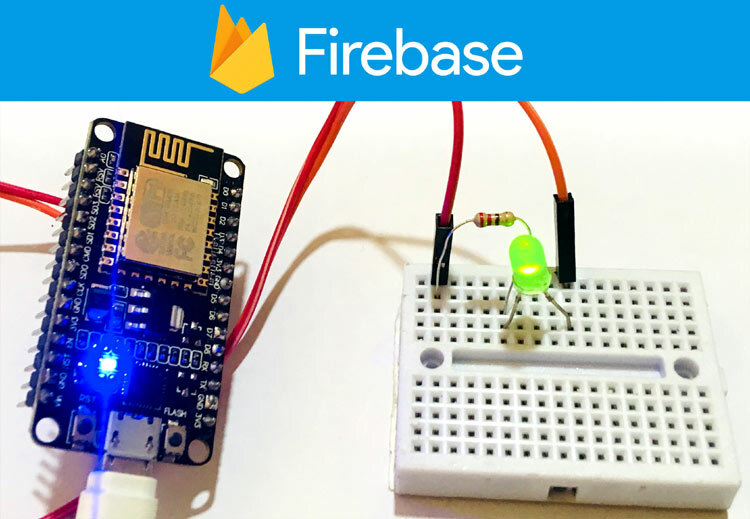 Open the firebase database and write “ON” or “OFF” or “on” or “off” in “LED_STATUS” section to control LED from Google Firebase console. Watch the Video below to understand the working of the project. We will send temperature and humidity data to firebase cloud in our next project.